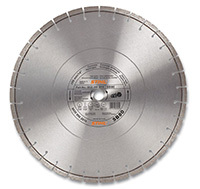 STIHL diamond wheels’ high-speed cutting can be 200 to 400 times that of an abrasive wheel. The computer-controlled diamond segment concentration is a gullet design. Its precision-tensioned inner core reduces noise and vibration.